Spring is in full swing here in Big Bear Lake and Snow Summit is open – Snow Summit Summer Resort, that is. Take the Sky Chair to the top for hiking, cross-country mountain biking or downhill mountain biking. Enjoy spectacular views of the Valley and Lake, see the Forest in bloom and get some great exercise too! We will have a brief blast of winter weather Friday night through Saturday, with temps rebounding back to normal on Sunday and throughout next week. Come up and enjoy our springtime weather roller-coaster! RS Vacations is still offering our spring special of Stay 2 Nights, Get the 3rd FREE, but there are only a few weeks left! Hurry and book your discounted stay before it’s too late! Book your Big Bear Cabin today!! Do you love to fish? Would you like the chance to earn some big bucks doing it? 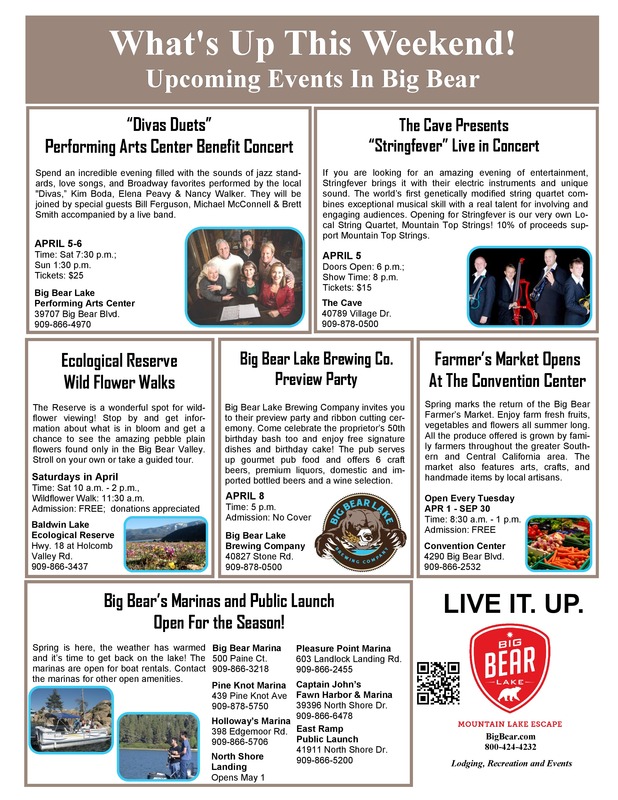 Every year, Big Bear Lake is host to several different fishing tournaments throughout the spring, summer and fall. Do you have the angler skills to reel in the big one? Following are the details for the upcoming events. When you see something you’d like to enter, be sure to visit our website at RSVacations.net and book a cabin for your stay. 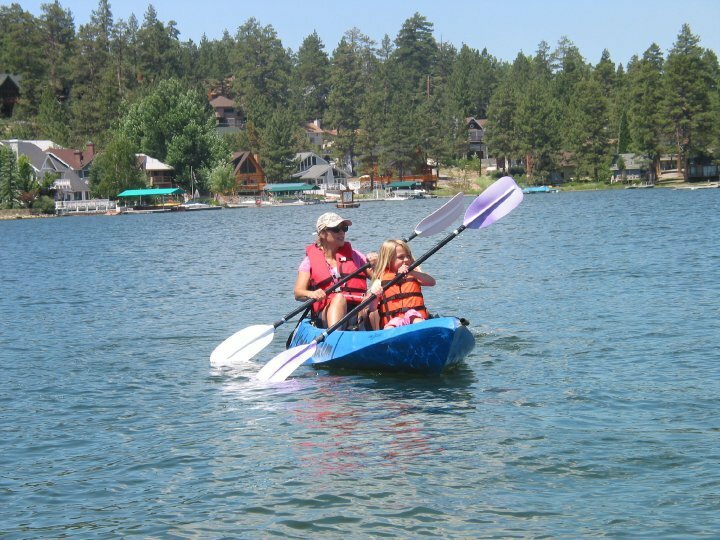 We have homes for every group and even have lakefront homes with private docks for your Big Bear Lake fishing trip! Book today!! Aaron’s Big Bear Big Bass Tournaments, Big Bear Charter Fishing and Big Bear Cool Cabins are hosting 8 bass tournaments on Big Bear Lake this year. Championship Series events are on April 12, May 17, June 21, July 19, August 16 and September 27-28. This Year two new events will be the Spring Bass on April 1st and the Fall Bass Blast on October 18th ( not part of Championship series)For tournament details please visit the website or call. Big Bear Lake Resort Association will pay $50,000 to an angler that reels in the grand prize tagged trout at the 6th Annual Fishin’ for $50K Trout Derby June 7 and 8, 2014. More details to be announced in early 2014. For rules and regulations or to register for the event visit http://www.bigbear.com or call 800-424-4232. Location: Big Bear Lake Visitor Center at 630 Bartlett Rd. Come to Big Bear Municipal Water District on June 21st and 22nd to participate in a once a year event to catch as many carp as you can with either a pole or a bow. Prizes and More. Aaron’s Big Bear Big Bass Tournaments, Big Bear Charter Fishing and Big Bear Cool Cabins are hosting 8 bass tournaments on Big Bear Lake this year. Championship Series events are on April 12, May 17, June 21, July 19, August 16 and September 27-28. This Year two new events will be the Spring Bass on April 1st and the Fall Bass Blast on October 18th ( not part of Championship series) For tournament details please visit the website or call. Aaron’s Big Bear Big Bass Tournaments, Big Bear Charter Fishing and Big Bear Cool Cabins are hosting 8 bass tournaments on Big Bear Lake this year. Championship Series events are on April 12, May 17, June 21, July 19, August 16 and September 27-28. This Year two new events will be the Spring Bass Blast on April 1st and the Fall Bass Blast on October 18th ( not part of Championship series) For tournament details please visit the website or call. This is a post from last year, but every year at this time when Big Bear Lake opens for boating and fishing, I think of my grandparents and all of the memories I have of spending time with them on the lake. So in case you missed it, here it is again. When I was a kid, my grandparents loved to take myself and my siblings fishing on Big Bear Lake. They had a pretty nice boat that they had named ‘The Jennifer Lynn’ after my oldest sister. Sometimes they would take all of us kids, sometimes we would go with them individually – but a good time was always in store. Now my Grandpa was a kind and sweet man, but he was also pretty stubborn about things. We always had to use proper words around him – no slang was allowed. He was a bit fussy and liked things just so. I guess he was a bit of a perfectionist (hmmm…I guess I got that from him 🙂 ) so I was always a bit on guard around him. Grandma on the other hand, ACTED that way around him, but she liked to be silly and ‘naughty’ on the sly. My mom told me stories about how when she was a kid, every once in awhile her mom would let her hide in the closet until Grandpa went to work and then let her play hooky from school and they would go do something fun. As most men are, my Grandpa was pretty competitive and really didn’t like to lose. Unfortunately for him, my Grandma was a very lucky fisherwoman. Very lucky. He would use all of these fancy lures and specialty baits and catch maybe one little blue gill. Grandma would slap some velveeta cheese on a hook and catch so many trout she would have to throw them back. Grandpa would get so mad! He just couldn’t figure it out. And when he wasn’t looking, she would look over at me and just giggle and giggle. Those were fun times and wonderful memories. The lake is open for the season and the fishing is great! Come on up to Big Bear and make your own special memories. Visit RS Vacations online and book your Big Bear Getaway today!! Big Bear Lake has several big Fishing Tournaments coming up. What better way to enjoy your fishing weekend than with a stay and this fantastic, lakefront home with your own private dock?! Book today before it’s gone! SPRING SPECIAL: 15% Savings on 3 or More Nights. Also check out our SPECIALS page for great discounts to area activities. THIS CABIN JUST HAD A MAKE OVER! ALL NEW KITCHEN, HARDWOOD FLOORS AND NEW CARPET! This cute cabin offers unbeatable Sunrise to Sunset Lakefront views in one of the best locations in all of Big Bear. The home features a boat dock (late April to Mid October) and boat parking as well. Bring your boat up by trailer and still have parking for 2 more cars. Nice and level parking in winter, and just minutes from the slopes and village. Located at the end of a private cul-de-sac, this nicely kept lakefront also has new furniture throughout with a brand new flat screen TV in the living area. You can enjoy the expansive view while sipping your coffee in the morning as you watch the waves lap onto the shoreline and have a romantic lakefront dinner by the fireplace in the evening! The larger downstairs bedroom has a comfy king size bed and flat screen TV, the other romantic downstairs bedroom has a queen with its own TV as well. There also is a full bathroom on the first level with a NEW washer and dryer for your convenience. The third bedroom, perfect for another couple or the kids, is upstairs with two double sized beds, TV and a 3/4 bath. The cabin has WiFi and free unlimited US long distance phone service. The outdoor patio has a propane BBQ, picnic table and outdoor seating when those gorgeous summer sunsets beckon you outside. 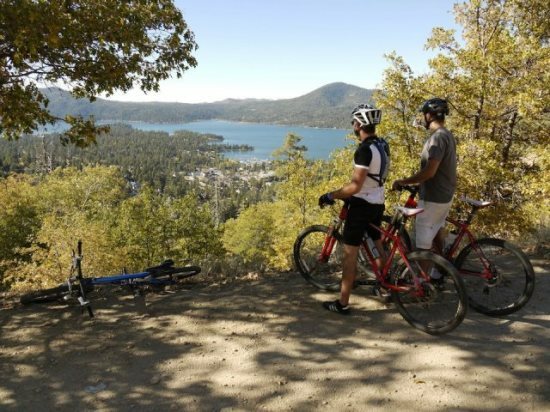 Lagunita is located within 1 mile of Big Bear Marina and Holloway’s Marina. You can rent a boat from either company as well as launch your own boat ($10 to launch and $10 to come back in). This location is really great all year round, just minutes to the Village, Snow Summit or Bear Mountain Ski Resorts. Pack up the family, the boat, and your fishing pole, and get ready to enjoy a wonderful stay at lovely Lagunita Lakefront Cabin. View more photos, check availability and book Lagunita Lakefront online at RSVacations.net today and treat yourself to a relaxing Big Bear Lake Vacation. WHAT GUESTS HAVE TO SAY ABOUT LAGUNITA LAKEFRONT:* I’ve been coming to this home for many years. I am an elementary school teacher, and this place has always reminded me of the story of the charming little house that maintains it’s character and style as the New York City high rise buildings grow up around it. This cottage on the lake is obviously a well loved family home, meticulously maintained and constantly being improved upon. There has never been a time when I haven’t come up to find something new or different. This time was no exception. The beds, linens, and towels are all new and the kitchen pots and pans and utensils have all been replaced. Lorri’s renovation and design background is clearly evident and her sense of style is obvious. The lake house would clearly attract a very discerning clientele, but as for myself, there is nothing more glorious than falling asleep in the lakeside bedroom with the doors open, the soft breeze blowing in, and the sound of fish jumping in the lake. And I have never felt closer to God than when sitting on the dock at night surrounded by the stars. Renters, be prepared to fall in love with the place and never want to leave! *Thanks! We want to book for next year. We always have such a great time at this house! *We had a blast and the house was really charming. The whole family had so much fun that they didn’t want to come back home!! It was a nice relaxing weekend. Thanks so much for your help. *I can’t say enough about this lovely home on the water! It was so very clean, comfortable, and extremely charming. And the views are breathtaking. I loved waking up in the morning, opening all the windows, having coffee on the patio and feeding the ducks. Our son spent hours on the dock fishing and watching the carp jump out of the water. We rented a pontoon and went out fishing four out of the six days we were there and jet skied the other two. Spent time walking around the village and exploring all the wonderful restaurants Big Bear had to offer! It truly was the most relaxing and fun vacation we have ever had and can HARDLY wait to return. I would not even think of looking for another place to stay on our next visit. This home felt like our own and we will be coming “home” again!!! *This cabin is about as perfect as can be. The view from the living & dining area was absolutely gorgeous. Each morning, we all grabbed our coffee and just sat outside looking at the pristine water. After our daytime activities, we headed back outside for the gorgeous sunsets. The cabin itself is incredibly clean and extremely comfortable. I can’t imagine staying anywhere else. *The house is very charming, cozy, comfortable and clean. The kitchen is especially well stocked with many small appliances available. The rustic and country decor compliments the environment…My grandchildren loved the private dock and the ducks that visited. Sunrise and sunset on the lake is a big bonus…Big Bear Lake is absolutely beautiful! *This cabin is perfect for a weekend getaway with a small group of friends…The view right outside the main living room is stunning! Since the cabin is located on a private cul-de-sac, it is very quiet and secluded…I would definitely recommend this cabin to anyone looking to have a relaxing stay or an activity-packed adventure. Summer or winter, this is the place to be! *I stayed at Lagunita Lakefront this winter, and was totally blown away by Big Bear Lake. It’s like another world just hours from the big city…I had no idea how close to the water it is, you can almost fish right outside the living room windows. I’m definitely coming back this summer, and trading in my ski poles for my fishing pole! We will be back! It has been a little cooler in Big Bear Lake this week but warming for the weekend and beyond. Now is the time to take advantage of lower, off-season rates and enjoy the added benefit of no crowds. This weekend you can enjoy a variety of music and theatrical entertainment, take a stroll through The Village or enjoy one of dozens of activities. The Lake is now open for the season, so now is a great time to come up and do some boating or fishing. Be sure to select any package(s) you want when booking your cabin at RSVacations.net. Your coupons will be waiting at your cabin when you arrive. See our SPECIALS/PACKAGES page for more details. Packages must be selected at time of booking. Not all discount packages are available during holiday periods. Coupons must be presented when renting to receive discounted rate. Other restrictions may apply. Even though we are starting out April with a late-season snowstorm, spring has sprung in Big Bear Lake. The Lake is open, the Farmer’s Market has started and the mountains are starting to come alive! Come on up!! On April 12th, the Moonridge Wolf Puppy Pack (all nine of them) will celebrate their 5th birthday on this earth. Please plan to help us celebrate their birthday at the Big Bear Alpine Zoo in Big Bear Lake, CA. The Zoo is located across the street from the Bear Mountain Ski Resort at 43285 Goldmine Drive. The party will run from 11:00 AM till 2:00 PM with gifts and treats for the pups, and we’ll have Docents available to share with you all of the details about the 5 boys and 4 girls that were born here in Big Bear to parents Navarre and Wakiza. For more details please call or visit website. (909) 878-4200. Five courses will be prepared and paired with selected wines from Sunland Vintage Cellars. Tickets are $65 per person and can be purchased by calling or visiting Le Dolce Vita. The 2014 Big Bear MS Walk takes place on Saturday May 3rd on the North Shore’s Alpine Pedal Path. The start/finish line will be at North Shore Elementary School. Welcome to the Big Bear Lake Half Marathon. This is road running at its finest. A scenic and challenging course full of steep up and downs, rolling hills and a two mile climb up to 7,300′ for a gorgeous run through Big Bear Lake’s most scenic neighborhoods. Race day also includes the Memorial 5k Fun Run, a scenic and challenging course along the border of the National Forest. Both events share the same Start and Finish in The Village of Big Bear Lake. The Big Bear Lake Half Marathon and Memorial 5k Fun Run is an official proud supporter of the Wounded Warrior Project! A portion of each race entry fee will be donated to the Wounded Warrior Project. Last year we raised $1000 for the Wounded Warrior Project at the 1st Memorial 5k Fun Run. With the addition of the Half Marathon we hope to raise a lot more this year! Location: Registration: La Montanas at 42164 Moonridge Road Race Start adjacent to Bear Mountain Ski Resort 43101 Goldmine Drive.